Magna-Power is a manufacturer of custom power supplies for industrial and research applications, based out of New Jersey. 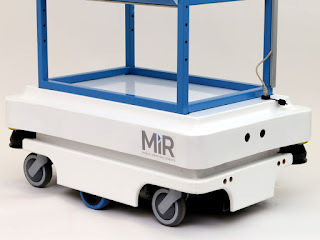 They're currently gaining manufacturing efficiency with two MiR100 robots, from Mobile Industrial Robots, in their facility. These two robots are improving logistics and efficiency for this manufacturer to help it compete in a global market. In the video below, the Vice President of Operations and the Vice President of Engineering at Magna-Power discuss the benefits of the MiR100 in their plant. They share the fast and easy set up they experienced, their confidence in the safety of the MiR100, and the cost efficiency of the robots. Enjoy the video below! C&E will be hosting a webinar featuring the MiR100 on Friday, January 13th. For details and registration, please CLICK HERE. For questions, please contact C&E at 800-228-2790. Thank you!